Company wellness program is the investment in the most valuable asset of the company i.e. its employees who are responsible to increase company productivity. By attracting the most talented workers according to whom health benefits act as an attractive perk with reducing absenteeism and lost time by having healthier and happier employees, and improving employee morale, which leads to a reduction in turnover. Goldstein Research analyst forecast the Corporate Wellness Market size is set to reach USD 12.56 billion by 2024, at a CAGR of 5.36% over the forecast years. The report covers the present ground scenario and the future growth prospects of the corporate wellness market for 2016-2024. We calculated the market size and revenue share on the basis of revenue generated from major players in Corporate Wellness across the globe. On the basis of solution type, improving business performance is the dominating area with 34.5% of corporate wellness market share owing to the increasing productivity of the organization, decrease absenteeism and presenteeism, reduce safety incidents and attract and retain top talent. 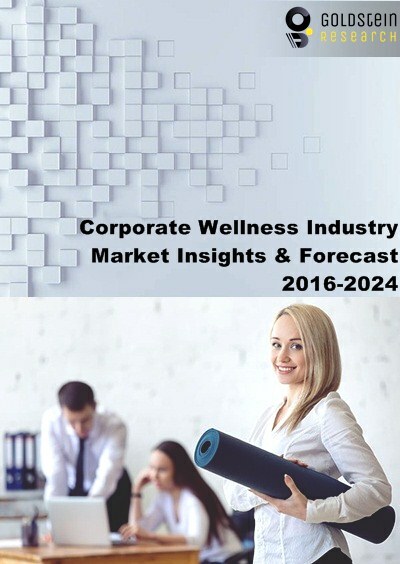 Corporate Wellness Market Outlook 2016-2024, has been prepared based on an in-depth market analysis from industry experts. The report covers the competitive landscape and current position of major players in the global corporate wellness market. The report also includes porter’s five force model, SWOT analysis, company profiling, business strategies of market players and their business models. Global market report also recognizes value chain analysis to understand the cost differentiation to provide competitive advantage to the existing and new entry players. Our global Corporate Wellness market report comprises of the following companies as the key players in the Corporate Wellness market: Well Nation, Virgin Pulse, Provant Health Solutions, ComPsych, EXOS, Kinema Fitness, Karelia Health, Marino Wellness, Premise Health, Wellness Corporate Solutions, WorkStride, Wellsource, Wisdom Works Group. According to the report, major driving factor for expansion of Corporate Wellness market is more data integration, addressing financial needs, making life easier, possibility of customization of services i.e. data, combined with increased insight into the benefits employees need and use, will streamline programs and help them be more effective, which can increase their credibility. Further, the report states that the major challenge in corporate wellness market is revenue volatility that can be obstructive for long term strategic decision such as time frame for capital investments. Based on geography, North America dominate the corporate wellness market with 35% market share while APAC hold the promising future potential for this market and tends to grow at a CAGR of 5.45% over the forecast period. Countries such as Japan, South Korea, China, Germany, Israel and the US hold the opportunities in corporate wellness market due to significant statistics of people above 60 years that will double up in near future. What is the penetration power of corporate wellness in various corporate sectors in 2015-16 and what would be the expected demand over the forecast period?